From the creator of The Radio Adventures of Dr. Floyd! Return with us now to the thrilling days of not too long ago when the west was wild and the rivers in the west were even wilder! Luckily there was one fish to maintain law and order, one fish to reel in those who dared disturb the peace and tranquility of Driftwood Gulch, one fish to stand for truth, justice and honor in the untamed rivers of the wild west...Deputy Guppy! The Caviar Kid has arrived in Driftwood Gulch and he’s gunning for Deputy Guppy! 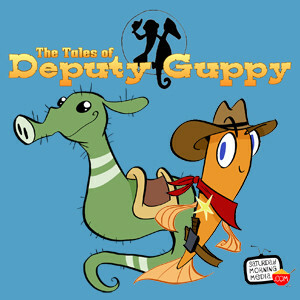 The tension has never been higher than in this Season 2 Finale of The Tales of Deputy Guppy! DOWNLOAD THE DRIFTWOOD GULCH SHERIFF’S BADGE HERE!